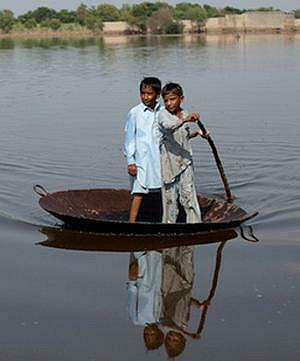 By Zafar Iqbal ISLAMABAD, Pakistan, September 27, 2011 (ENS) – Environmentalists are blaming climate change for the unprecedented massive monsoon rains in Pakistan, which so far this year have affected eight million people, claiming 350 lives and damaging 1.3 million homes. Over the past month, the country’s southern region has received the highest monsoon rains ever recorded, local metrological experts confirm. In August, the southern parts of the country received 270 percent above-normal monsoon rains. And in September, the monsoons rains were 1,170 percent above normal, says Dr. Qamar-uz-Zaman Chaudhry, Adviser Climate Affairs. The Sindh province, where six million acres of land were inundated in current floods, had experienced severe drought conditions before the monsoon season and had not received any rainfall at all during the past 12 months. Aid agencies are scrambling to help the multitude of flood victims – more than 1.5 million people are living in temporary camps. Pakistan has witnessed swift climate change because of rising temperature and flooding downpours in the past two years. Climate experts consider this unexpected change as a part of broader regional climate changes also happening in the neighboring countries. “Our country is experiencing climate change and the monsoon patterns, which had focused India and upper parts of Pakistan, and now it has shifted to Sindh and adjacent areas,” believes Arif Mehmood, a weather expert affiliated with the Pakistan Metrological Department. Pakistan lacks adequate resources and expertise for climate protection, so some experts have suggested the government to seek assistance from the Green Climate Fund for implementing climate change measures. In December last year, the Green Climate Fund was established during the annual summit meeting of governments that are Parties to the UN Framework Convention on Climate Change (UNFCCC) in Cancun, Mexico. The Fund is to raise and disburse $100 billion a year by 2020 to protect poor nations against the impacts of climate changes and assist them with low-carbon development. 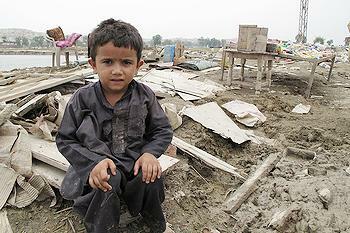 This is the second year running that Pakistan has suffered the worst weather-related disaster in memory. 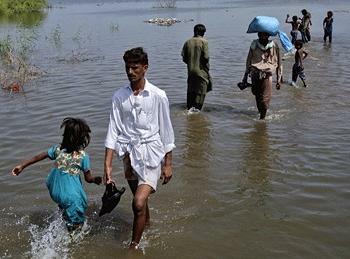 In 2010, at least 20 million people were directly affected and nearly one million homes were destroyed in the floods. More than 2,000 people lost their lives. Even after one year, more than 800,000 families displaced by the 2010 floods remain without permanent shelter and more than a million people remain in need of food assistance, according to aid agencies. Weather related disasters hit the country regularly, however, little has been done by the government in adaptation and mitigation to the climate change. The government released a National Climate Change Policy recently, but there are many obstacles to implementing any such policy. Pakistan faces economic constraints, a lack of public awareness of the climate crisis and lacks expertise in climate change mitigation strategies. The humanitarian agency Oxfam says the effects of fresh floods in Pakistan could have been prevented if efficient disaster risk reduction mechanisms had been installed in flood-prone areas after the last years disastrous floods. Deforestation has been blamed for massive rains and colossal flood damages. Khurshid Ahmed, an environmentalist from Peshawar University, says most of the logs illegally cut from Pakistan’s forests have been washed away by the recent high-speed rains that not only caused habitat damage but also hindered the smooth flow of rainwater in streams, canals and the rivers. “The same logs, when taken along in the flood waters, blocked the low clearance of concrete bridges and diverted the flow of water from the main stream towards the nearby population,” said Ahmed. Illegal human encroachment onto river banks, and even into river beds, also hindered the flow of water, as did the houses built along the path by the river, which were blown away. Melting of glaciers in the region is another reason for the unprecedented floods and rains in Pakistan, both governmental and NGO officials say. Likewise, Leadership for Environment and Development, an international organization working for protection of environmental and natural resources, has projected that melting of glaciers in Himalayas will increase floods and damage water resources in the coming decades. This phase will followed by decreased river flows over time as glaciers recede, LEAD points out. “Coastal areas bordering the Arabian Sea in the south of Pakistan will be at greatest risk due to increased flooding from the sea and in some cases, the rivers,” accourding to a recent LEAD report. 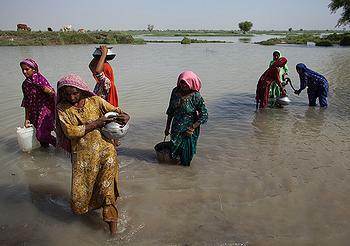 Over the past few decades, climate change has had extreme effects across the South Asian region. A new Asian Development Bank study warns of the future displacement and migration of tens of millions of people in Asian countries by the effects of climate change, including rising sea levels, floods, droughts and reduced agricultural productivity. “Rising temperatures and rising tides due to climate change could reduce food supply in the Pacific. With over 10 million people in developing countries in the region, this is a threat that we cannot ignore,” said Mahfuzuddin Ahmed, a senior economist with the bank, who wrote the report. In order to tackle the damaging affects of climate change, Pakistani needs to take immediate steps, says Ejaz ur Rehman, an ecologist.